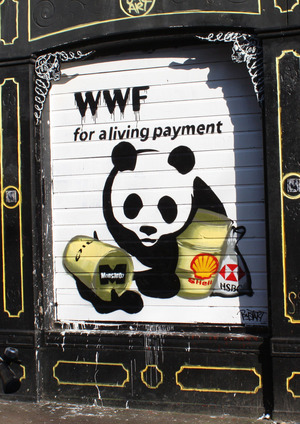 Street artist bustart visualizes some of WWF's corporate connections (as revealed by the Pandaleaks website) on a shutter in Amsterdam. The title is a reference to the WWF's Living Planet report. A recent WWF report informed us that 40 per cent of our wild animals have been lost over the past 40 years. But don’t panic, the WWF website assures us: a donation can help make a difference. A few days later, WWF were in the headlines for a reason that makes you wonder what kind of difference they actually make. Survival International, which campaigns for indigenous rights, accused them of being complicit in the abuse of Ba’aka people in southeast Cameroon.1 Not only have they been forced from their homes to make way for national parks and game reserves, but WWF-funded anti-poaching squads are using violence, torture and intimidation to stop them hunting for food and to extract information about ‘poachers’. But the picture becomes yet more alarming. WWF and other large international conservation organizations are involved with national park management across the region, including parts of Gabon and DR Congo, capturing much of the Ba’aka’s ancestral land. When you look back on the history of conservation it’s easier to understand the mind-set underpinning these evictions. Aristocrat hunters established the Society for the Preservation of the Fauna of the Empire (SPFE, now Flora and Fauna International) in 1903. This was a starting point for the conservation movement, resulting in huge international NGOs that dominate the scene today. At the time SPFE was founded, hunting was an important part of élite society and hunters were becoming concerned that their game was being wiped out. Ironically, the colonialists apparently also felt they were needed to protect Africa and its extraordinary wildlife. The attitudes of these conservationists haven’t changed much since. It’s very much a colonial, imperialist, racist attitude where the white man is the great saviour, where he knows better than the people who have lived in the forests for generations, where he’s a ‘sportsman’ and indigenous people ‘poachers’; where killing for a trophy is noble and killing for food is a waste; where mining, timber, agriculture and tourism infrastructure are necessary but wood fuel for local people is destructive. Africa’s very first National Park, Virunga in DR Congo (established 1925), involved the eviction of indigenous Bambuti people. Now more than 100,000 protected conservation areas exist around the world, many due to the efforts of five conservation groups: WWF, Conservation International, AWF, Wildlife Conservation Society and The Nature Conservancy.5 From the 1950s onwards particularly, they became involved in identifying land for national parks, providing the funds to buy and manage them.6 As time has gone on, the relationship between these imperialistic conservation NGOs and indigenous communities seems only to have got worse. Today the NGOs also partner with corporations trying to get their hands on the land. 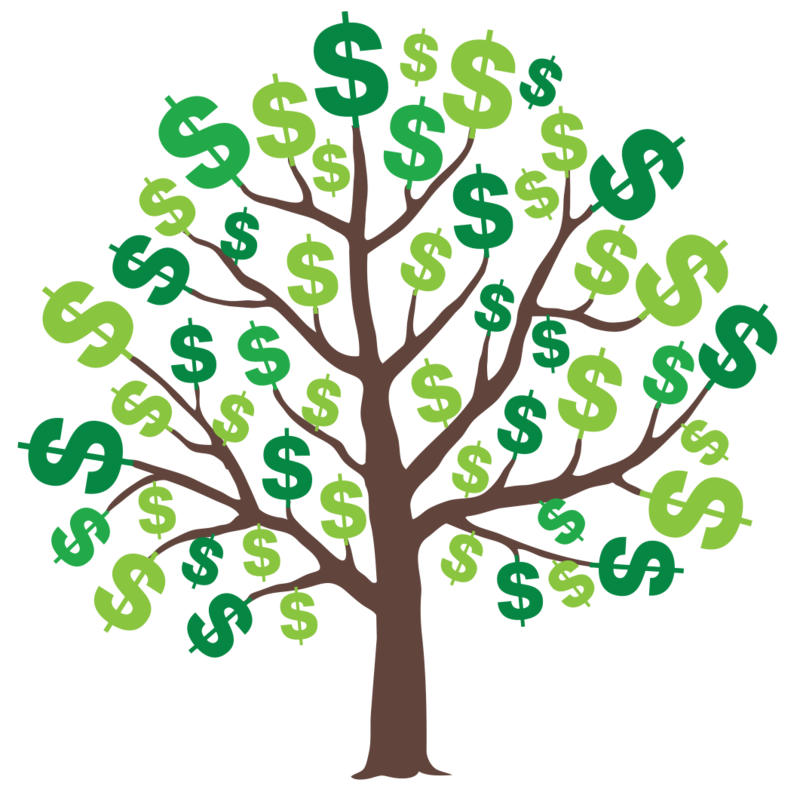 $2.4 billion – joint annual income of WWF, Conservation International, African Wildlife Foundation, Wildlife Conservation Society and The Nature Conservancy. In 2011 WWF was accused of supporting timber companies through its Global Forest Trade Network. According to a Global Witness report, the rules of the network were so flimsy companies were sourcing illegal timber and abusing local communities while sporting the WWF logo as a seal of approval.7 WWF is known for its involvement in various industry round tables and certification schemes such as the Forest Stewardship Council (FSC); its corporate relationships earn it millions. Wildlife Conservation Society has long worked with FSC-certified Congolaise Industrielle des Bois (CIB), a timber company operating near Nouabale-Ndoki National Park. They work in partnership to track down poachers, who are apparently more of a problem than a timber company. Following much criticism of its destructive operations and resulting financial difficulties, CIB was bought by Olam International, described by Greenpeace as a ‘Congo-trashing company’ due to its logging concessions, which cover 1.8 million hectares of the Congo Basin.8 Olam is also involved in expanding oil palm plantations in the area. The big conservation NGOs often share board members with destructive industries, and work with them supposedly to restrict their environmental damage. It’s hard to find evidence that this is anything but a trade-off between funding and PR. In their fantasy world we can maintain our lifestyles (bar perhaps using fewer plastic bags) and have economic growth and save the planet. In their attempts to have it all, big conservation groups often back carbon offsetting, which allows companies to buy credits to exceed their emissions limits. Credits are generated by projects that take carbon out of the atmosphere – often projects that protect or restore land. You’ll see the usual suspects working closely with government and corporations on initiatives such as Clean Development Mechanism (CDM) and Reducing Emissions from Degradation and Deforestation (REDD). Indigenous people are accused of damaging the forest and evicted so that carbon credits can be earned and traded. The projects are often carried out by NGOs but their active promotion of carbon trading also provides a smokescreen for government initiatives. There are many examples of abuse and evictions linked to such projects, including the Sengwer people for a World Bank-funded REDD project in Kenya and 22,000 rice farmers in Uganda, evicted to make way for a project run by FSC-certified New Forests Company.9 In both cases, homes were burned to the ground. The dramatic, emotional statements about extinction and destruction we read in these NGO’s fundraising appeals mask the fact that their actions uphold business as usual. They are so invested in the status quo that they’re completely missing the point. They make people with the least impact the scapegoats and befriend the real culprits. Instead of asking hard questions about the political and economic drivers of biodiversity loss, they’d rather keep up the pretence that we can save the world without making any fundamental changes to the way we live as a society. Sophie Pritchard is the co-ordinator of Edge Fund, a member-run fund supporting grassroots action for radical social change in Scotland, Wales, England and the whole of Ireland. She wrote this piece in a personal capacity.